More than a hundred partners in Rochester and Penn Yan joined us March 3 to celebrate the launch of our new name, Common Ground Health. We rebranded to better reflect our mission to help the Finger Lakes region find common ground on health issues. Common Ground Health’s Practice Transformation team has launched a new resource library for clinicians and providers. Materials are available to enhance connections among primary care practitioners and community-based organizations. 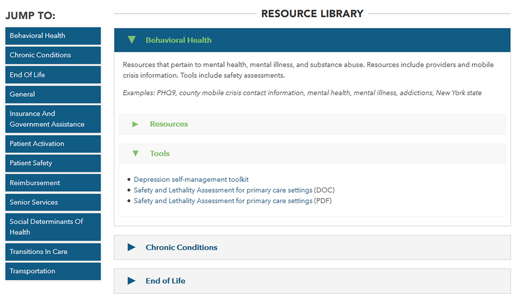 These resources include clinical toolkits on depression self-management and information on chronic conditions for people with low health literacy. There are also links to public assistance resources and lists of local transportation services and food cupboards. “Providers can use the resource library to offer better care,” said William Brien, director of practice transformation for Common Ground Health. 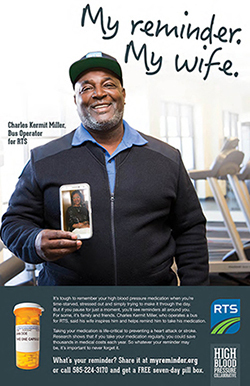 Working with the Greater Rochester Chamber of Commerce's High Blood Pressure Collaborative, St. John’s and Regional Transit Service brought the collaborative's My Reminder campaign to their employees. 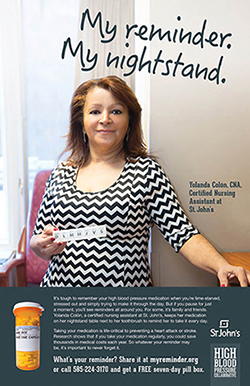 As part of comprehensive worksite wellness programming through a partnership with Common Ground Health and the Center for Community Health, URMC, RTS and St. John’s arranged for several employees to appear in customized posters displaying their medication reminders. “St. John’s and RTS are doing a fantastic job creating worksite wellness programs that encourage employees to champion healthy living,” said Dina Faticone, director of community health and engagement for Common Ground. Did you know that one organ donor may save up to eight lives? Although a 2015 study found New York trailed the nation in organ donation, a new state law aims to counteract that trend. Teens ages 16 and 17 can now indicate intent to be organ donors when they apply for learner's permits or driver's licenses. Watch this poignant video from the Finger Lakes Donor Recovery Network and Causewave Community Partners in honor of National Donate Life Month during April. To learn more about organ donation in our region, click here. Democrat and Chronicle Why don't more NY students eat school breakfasts?